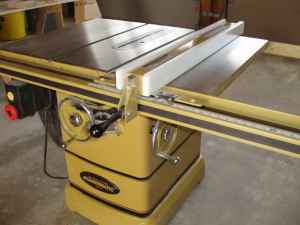 I have had this saw in my shop for around 3 years, bought it new. After a couple of months the spring for the arbor lock broke and I have had to manually push it in and out to lock the arbor for blade changes. Now the actual locking metal part broke and I have to forcefully use a screwdriver to lock the arbor to change the blade. I thought this was a good option at first but it is a really weak design. They should of kept the 2 wrench system. I replaced a Grizzley saw that I had for around 8 years and wanted to upgrade to a Powermatic. 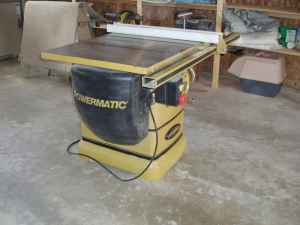 I was never able to bog the Grizzley down but this Powermatic will bog down when cutting anything over an inch thick. I have to go really slow so as not to bog it down. All in all I am very disappointed with these problems I am having. The height and angle adjusters are very smooth and I like the way the dust collection is wrapped around the blade. I should have bought the model 66 instead. Join in and write your own page! It's easy to do. How? 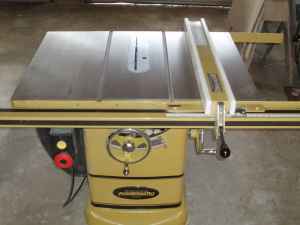 Simply click here to return to Tool Review: Powermatic 2000 10" Table Saw.